Hiking uphill: Sticking with the HYOH theme, figure out what your works best for your body here. Some people are built to just power through and plow up a hill, some need to take it super slow, some need lots of breaks. Use trekking poles, I always have them and use them anyway, but especially on hills they help your body work more efficiently. Hiking downhill: Definitely take your time going downhill. Statistically more falls and injuries happen on descents than on ascents or flat terrain. Again, use your trekking poles, not only for support and balance to prevent falls but also to take some of the weight and pressure off your knees and joints. Night hiking: Hiking through the night and sleeping and napping during the day is an awesome way to beat the heat on hot summer days. Make sure you carry spare batteries for your headlamp if you’re going to be doing a bit of night hiking. Check your route ahead of time to make sure you won’t come across anything too crazy in the dark, like a difficult/high elevation summit or a river crossing. 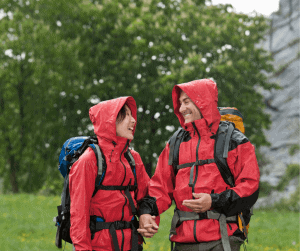 Hiking in the cold: Always bring, and wear, enough synthetic layers to stay warm plus an outer shell to keep you dry and help block some wind. Keep moving to stay warm. Take shorter, more frequent breaks throughout the day until you can hunker down in your sleeping bag at camp for dinner and a longer rest. 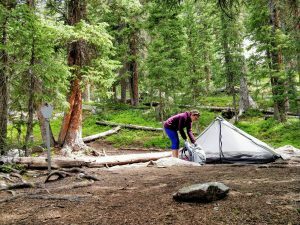 Test your tent for waterproofness before you go out: I can’t tell you how many hikers I see posting from the trail – oh, it’s day 4 and I’m stuck out here and it’s a horrible storm and I found out my tent isn’t waterproof/seam sealed. And they’re wet, their sleeping bags are wet, they’re not close to a town at all – what do they do?!?! Well honestly…. at that point you’re kinda screwed and are gonna be wet, cold and miserable for a while. BUT you can prevent this! Test your gear people. Set your tent up in your backyard before you go and thoroughly spray it down with a hose and see what happens on the inside. Or if the timing is right, sleep out in it in your backyard during storms and see how it does. Especially when it first starts leaking, make note if it’s just in certain spots, around the seams or just everywhere, then fix it up. You can seam seal it at home or most companies/brands offer a seam sealing treatment that you can send it back to be done, or re-waterproofed, or you can waterproofing spray to use at home and treat your tent after it’s dry and the rain has stopped. If you don’t hang a bear bag, use a bear canister or Ursack instead: If you won’t hang a bear bag well enough to actually keep it away from bears, then it’s worth investing in a bear canister or Ursack instead. While they are easier to use, they’re also way more expensive and bear canisters are particularly heavy and bulky. Unfortunately though, bear canisters are required in certain national parks or other areas, so check the rules and regulations before you head out. The only knot you need to know: Truly this thing is like magic. It’s easy to learn, easy to use and easy to untie. The only reason I personally ever use a knot while backpacking is to hang a bear bag, and I use the slip knot. My husband is a hammock camper and has also only ever used the slip knot to rig up his hammock. You can also use the slip knot to hang up a clothes line. Start a fire easily: Learn and practice starting a one match fire with lots of natural kindling and waterproof matches. As an alternative, or in tricky/sopping wet climates, use a cotton ball dipped in Vaseline to help get you going. I always carry a few of these cotton balls in a small ziploc bag in my first aid kit. Carry a collapsible plate: I love this thing! Thin, collapsible camping plates are very lightweight and great for cutting up meats, cheeses or veggies you might want to add to your dinners. Or if you just need a little space to help prep, eat or share your food, a plate will do the trick – please be wary of letting your food come in too close of contact with picnic tables. According to WebMD, picnic tables harbor more germs than port-a-potties – let that sink in for a second. Mark your clean and dirty water system very clearly: First, you should always be treating/purifying your water one way or another, or two ways to be safe. 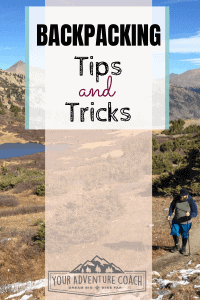 For example, if you use a filter system, you’ll probably have one bottle/bag/cup/something to collect ‘dirty’ water from the source, then filter into a ‘clean’ water container – you don’t want to accidentally mix these up or cause confusion for your hiking partners. Make sure it’s easy to tell which is which. Carry a dromedary bag: During the day while I’m hiking, I don’t usually carry more than 2 liters of water, in 2, 1 liter water bottles, but once I get to camp, I like to stock up on enough water to get me through cooking dinner, drinking water for the evening, cooking breakfast, drinking water for the morning plus 1 or 2 liters for the road. So, having a 3+ liter dromedary bag, plus my water bottles, enables me to stock up on all that water, or if I ever need to carry extra water long distances between water sources. BUT what I love about certain dromedary bag caps is that they make hand washing or dish washer super easy if they can spit out that tiny stream of water. Find a flat spot to sleep: Or sleep with your head uphill if you’re slanted. If you do find a flat spot, really look at the ground though to make sure you won’t be sleeping in a giant puddle if it rains. If you are on a slant: Prevent your sleeping pad from sliding around by putting dots or lines of silicone seam seal on the floor of your tent and/or the bottom of your sleeping pad, or use one of those rubber placemats. Keep your pillow from sliding around by sliding a shirt over the pillow and sleeping pad. Sleep with your battery operated things: When it’s real cold at night, keep your battery operated items working at their best by keeping them warm in your sleeping bag with you. You also might want to sleep with your water filter if you think it might freeze, because a frozen water filter won’t do you much good! Stay warm on a cold night: Sleep with a hot water bottle or hot hands hand warmers in your sleeping bag. I personally am too paranoid to put a water bottle in my sleeping bag – cause you know that would be the one time it leaks! 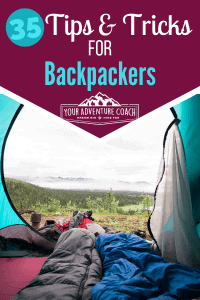 Lighten your load with this backpack weight calculator: This is the tool I created to shed over 5 pounds off my pack weight, a friend used it to drop about 13 pounds off her pack!! (haha she had a lot of heavy stuff though!) This is a functioning spreadsheet, already set up with all the gear you should have and spaces to add in any extras you might need/ Then you enter in the real weights of each item and not only does it calculate out your base weight and total pack weight, but gives you comparisons all along the way to tell what each gear item should weigh, approximately, so you can quickly identify exactly which items are breaking your back. Don’t forget to turn off any tracking devices for the day and mark a way point in your GPS, if you have one. Conserve battery life and data, if you’re using it, by shutting everything down when you reach camp. Bring a bug net: My husband always laughs at me when I wear mine, but seriously, I can not stand those tiny gnats and flies getting in my eyes, nose and ears!! Don’t use Deet around gear: Deet has been known to break down and eat through our expensive, technical, synthetic gear items, and while effective, is also questionable whether you should be putting that on your body. Use permethrin to treat clothes, shoes and gear items before your hike and picaridin as bug repellent on your body and skin as effective, arguably healthier, gear-safe alternatives to Deet. Carry a buff, or a couple: Buffs or neck gaiters are amazing because they have so many uses. You can wear it as an extra layer around your neck if you’re all bundled up trying to stay warm (or even get a fleece one for that.) I like to wear mine like a head band because I have truly crazy hair, so it’s one of the few things that actually helps keep it contained. On a hot day you can dip your buff in a cold stream and put it back on your head or neck to help keep you cool. You can use as a camping pillow case. Use it to clean your glasses, or wipe your face. Use a leaf to funnel water: Sometimes we come up to a water source that is barely even a trickle moving across the ground and it’s damn near impossible to actually get the water into a water bottle/bladder/container of any kind. Usually with a little searching and persistence, you can find a spot that is slanted enough that you can prop a leaf in the water source to help funnel water off the ground and into a water bottle. Hand warmers to stay warm: Like I mentioned above, these are great to slip into your sleeping bag on cold nights, but also great to use during cold days. Put them in your gloves to keep your hands warm, or in inside coat pockets or even pants pockets inside your rain pants to help add some heat inside your layers. Wash your clothes, or at least underwear, on the trail: Bring a lightweight, portable wash bucket and biodegradable soap to give your smelly, dirty hiker clothes a quick wash in between towns. Or wash in your bear canister, if you’re carrying one. Just remember, even biodegradable soap should never be put into streams and natural water sources. Practice Leave No Trace and carry all water at least 200 feet away from streams and campsites, then wash and rinse everything well. Body glide is you friend: Chafing happens. It could happen anywhere to anyone but long distance hikers are especially prone and body glide can save you a lot of hurt out on the trail. Keep your feet happy: Prevent blisters by wearing shoes that fit your feet properly, go to an outfitter if you need help finding these. Wear synthetic hiking socks, like Fits, and let your feet, socks and shoes air out as often as possible, overnight and during every break while hiking. Replace the crappy insoles that come in your shoes with ones that will support your feet and joints through the beating that backpacking puts them through, like these Superfeet. 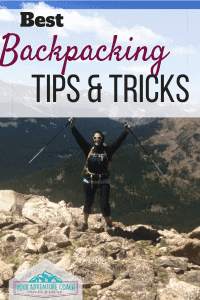 Make sure your pack fits: A pack that doesn’t fit properly could cause unbearable, repetitive pain and blisters on the hips, lower back, shoulders or sides. A good pack that fits your body well makes all the difference so you have less pain and discomfort at the end of the day. 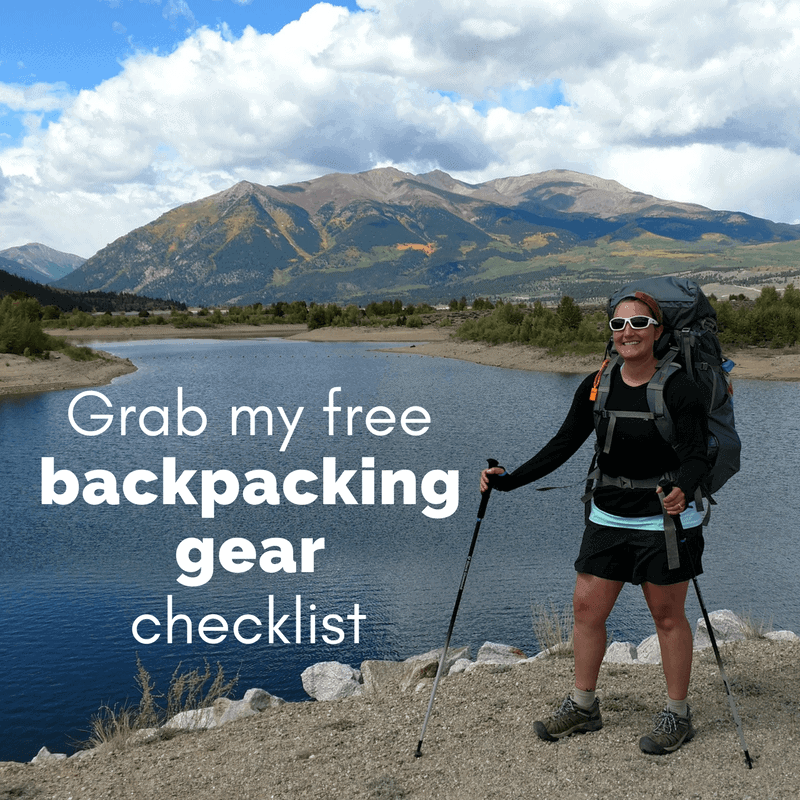 Go to an outfitter to be measured and fitted for a pack if you need help with this. You only need a small knife: Really though. No need to carry a machete or a hatchet or a saw. You really only need a decent, small, lightweight pocket knife. Clean, maintain and repair your gear: Sometimes your gear just needs some love before you run out and replace it. Stove not working quite right? Give it a good scrub down with some mild soap and water. Zippers snagging? Clean it with a bristled brush and water to remove dirt from the teeth. Sleeping bag lost it’s oomph? Give it a wash down specific cleaner, rinse well, and fluff in the dryer with tennis balls and no/low heat. Rain jacket seeping water? Wash it with Techwash, then re-apply waterproofing. Always pack camp shoes: Don’t skip out on camp shoes to save weight. They really can be anything. Just anything to give your feet a break from your hiking boots and let your boots air out. It’s personal preference, but I usually still wear socks with my camp shoes so I opt not to use flip flops or anything that goes in between your toes. 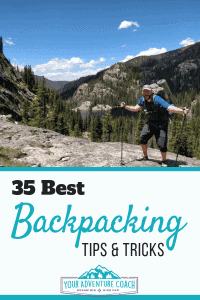 I hope these tips and tricks help you out on your next or first backpacking trip. 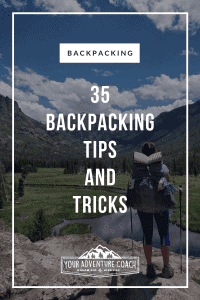 Let us know your favorite backpacking tips and tricks in the comments below!